I’ve got a confession to make – it won’t come as a surprise to the people who know me, but for the benefit of everyone else – “I am allergic to supermarkets”. I can’t stand the unsteerable trolleys, the whinging children, the dawdling people, the quadruple handling of the items, the polite conversation with the shop assistant, packing bags, carting it back to the car, unpacking at the other end… Perhaps my attitude will change once I have got plenty of time on my hands to be mooching around the shops instead of working my heart out to earn enough money to sail around the world. But even then, I would much rather be sailing and exploring as opposed to wandering the aisles of the supermarket. So with that in mind, how does one go about provisioning a boat (or your house for that matter) for breakfasts with limited fridge space and possibly long periods between supermarket visits? Here are some of my suggestions. I would love to hear your favourite breakfast recipes too, so if you post them in the comments section, or send me an email, I will make your recipe, take some photos and add it to this post. Andrew and I can’t function without our morning cup of coffee. On the boat we usually have plunger coffee, or alternatively a perk boiled on the stove. To save boiling the kettle over and over, particularly if you are on a passage, it can be a good idea to get a thermos flask to keep water hot and then just make your hot drinks on demand. Our Stanley Thermos kept water hot for over 24 hours on a recent passage down the coast. 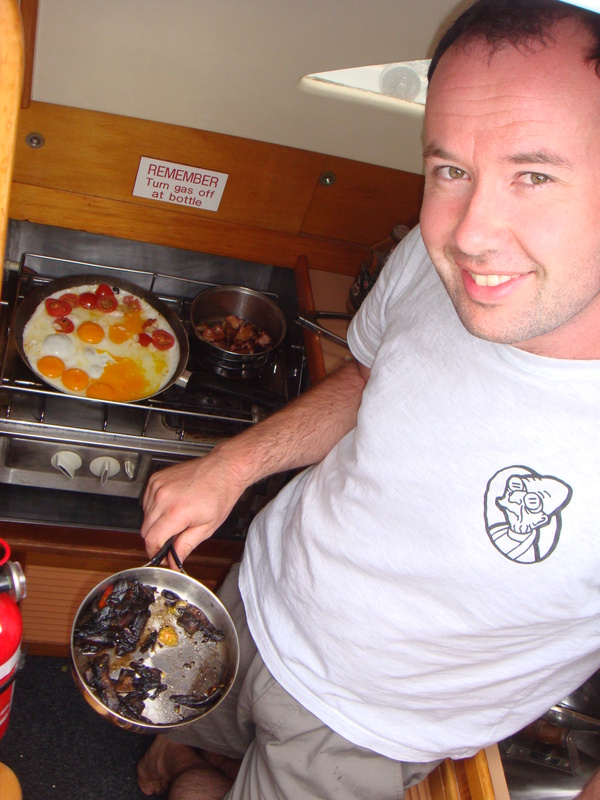 Silicone pop up kettle – saves heaps of space in the cupboard when underway! Heat oven to 160 degrees C. Place all ingredients except for the fruit & honey in a large baking dish and stir. Place in the oven for 30 mins, stirring occasionally. Remove from oven and add dried fruit & honey. Stir well, allow to cool and store in an airtight container. Store bought yoghurt has a reasonable fridge life, but if you are short on space, or away from a supermarket for a long time, you can make your own. We have got a yoghurt maker. Which is basically just a big insulated tub, with a smaller tub inside. Simply buy the yoghurt sachet mixture, add cold water to to the mixture in the smaller tub and shake it up, then add boiling water to the bigger tub and put the small tub inside for 8 hours. No power required (other than boiling the water). If you don’t have the yoghurt maker, you can also make it in a thermos using powdered milk. I haven’t tried this but Carolyn from the Boat Galley has got a great recipe here. You can get all kinds of flavours including just plain, and then add your own fruit. Provision the boat with a variety of the above to make things interesting. To make it all look fancy, you can layer it all together in to a glass (or in our case, a plastic glass) or alternatively just serve in a bowl. Add all the ingredients to a pan and heat slowly stirring for about 5 minutes. Add extra milk or water to get the consistency you like. Top with brown sugar, fruit, banana, cinnamon, tinned apples, pecan nuts etc. Seth’s favourite! Add the eggs and flour together along with a slosh of milk to get a runny batter. Melt a teaspoon of butter in the frying pan, then add a ladleful of batter in to the pan, tip the pan around to get it to spread out to the edges – fry until golden and then flip over. Serve with a squeeze of lemon and sugar sprinkled over the top, roll it up to eat. You can also have chocolate sprinkled in once one side has cooked, or fruit. 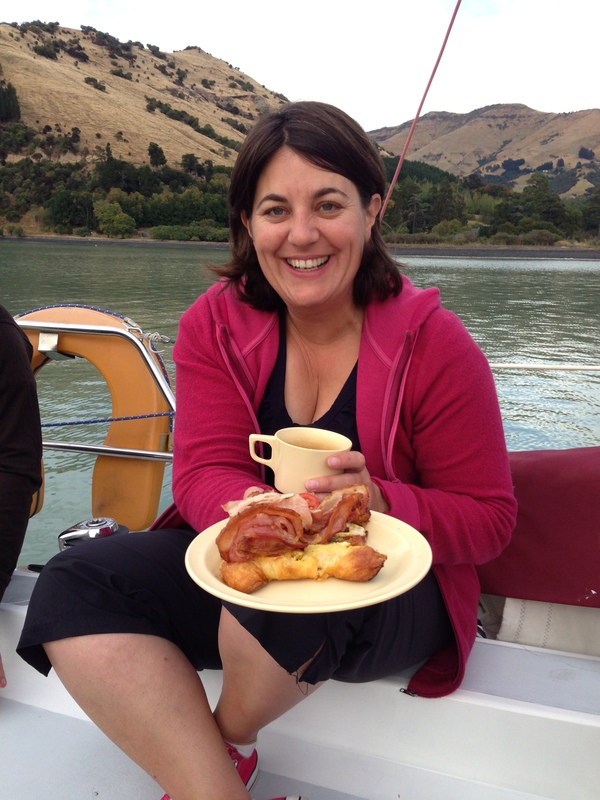 I made these cinnamon rolls on a recent trip to the Marlborough Sounds. They were a huge hit, but quite fiddly to make. You could probably get the same taste by making a sandwich with the ingredients below and cutting them in to soldiers and save yourself all the rolling action. If you do roll them up, just cut the crusts off the bread and roll them flat with a rolling pin (or a wine bottle) before adding the mixture. Beat the egg and milk together in a bowl and set to one side. Combine caster sugar and cinnamon powder in another bowl and set to one side. Mix the softened butter, brown sugar and cinnamon powder together and spread it on the bread. Roll them up or add another piece of bread and cut in to soldiers. Dip in to the egg mixture and fry in a pan with butter, turning until brown all over. Remove them from the pan and dip them in the caster sugar mixture you prepared earlier and serve! Beat the eggs and milk together and dip the bread in to the mixture. Fry in the pan with oil or butter. Turn and brown on both sides. Serve with fruit – bananas are good, so are berries – fresh, frozen or tinned and maple syrup. If you want to be extra decadent then you can add whipped cream too. I recently bought a Tupperware Power Chef – it is amazing. The coolest thing is that it will chop up stuff and it doesn’t need any power! It has a pull-cord system like an outboard motor. Pull the cord a few times, and it chops everything up like magic! There is also a beater attachment too. To make a fruit smoothie for breakfast simply throw a combination or some or all of the following in to the Power Chef and pull the cord a few times and voila! Fruit – bananas make it like a thick shake, but you can add any other fruit in there, fresh, frozen, or tinned. I used raspberries, strawberries and blueberries. Protein Powder – if you want, this can help fill you up for longer and give you a bit more power. Andrew makes a mean cooked breakfast as a special treat on a Sunday morning. One of the best cooked breakfasts we have had on Wildwood was made by my friends Ken & Karina one New Years Day in Diamond Harbour after a particularly large night. Deeeelicious! 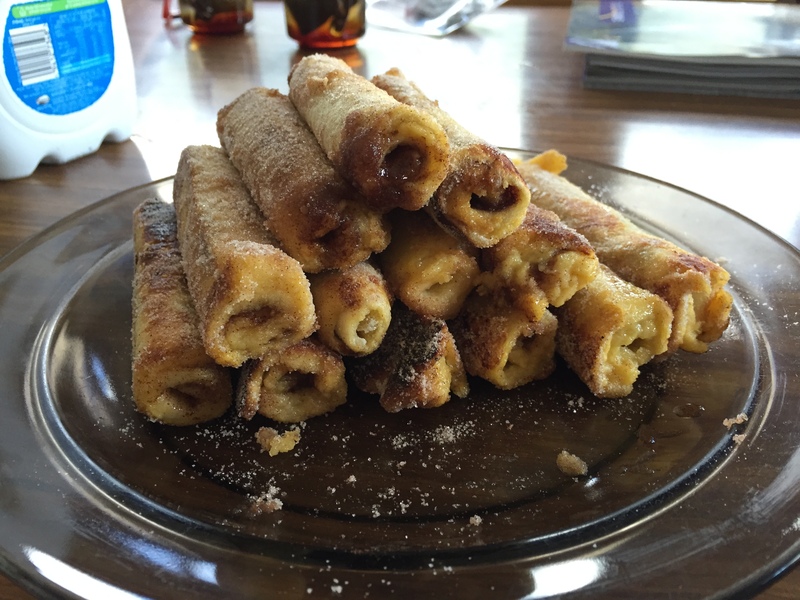 Beat up your egg, cut the croissants in half, dip them in the egg mixture and fry in the pan – like French Toast. In a separate pan or in the oven, cook up the bacon until nice and crispy. Slice up the tomatoes. Add the tomatoes, bacon and a dollop of pesto inside the croissant like a sandwich. Heaven! I am no expert in making bread, so I consulted the brilliant Boat Galley website which has a fantastic step by step guide and all sorts of bread making tips and the Cooking on a Boat Facebook Group for some ideas. My plan is to perfect my bread cooking at home, so I am an expert by the time we move aboard – and Wildwood doesn’t have an oven which makes things a bit difficult to practice on board at the moment. This makes a small loaf suitable for two people for lunch one day and breakfast the next. Check out the Boat Galley website for the full recipe which explains it all in detail. I made a fabulous light loaf by following Carolyn’s instructions. If you are miles away from a bakery, you can make your own bread. Eat it fresh for lunch – sandwiches, and then the following morning as toast. A good long life alternative to bread is wraps. If the weather is rough and makes preparing breakfast difficult, it is a good idea to have some muesli bars pre-made or purchased to have on hand as a quick snack. Optional step: Toast your oats in a 350 degree F (176 C) oven for 15-ish minutes or until slightly golden brown. Otherwise, leave them raw – I just prefer the toasted flavor. Once thoroughly mixed, transfer to a baking dish or other small pan lined with plastic wrap or baking paper so they lift out easily. Cover with plastic wrap, and let firm up in fridge or freezer for 15-20 minutes. Remove bars from pan and chop into 10 even bars. Store in an airtight container for up to a few days. Another handy breakfast on the run or morning/afternoon tea option. Measure flour and Sugar into a large bowl. Add the flavour of your choice. Melt butter, add milk and eggs. Beat with a fork to combine. Tip liquid ingredients into dry and fold together until flour is dampened. Do not over mix. Spoon into 12 greased or oil sprayed muffin tray and bake at 200°C for 10-15 minutes. Provision with a variety of different options – Fresh, frozen, tinned and dried. Use up your fresh food for the first week or so and then move on to your frozen, tinned, dried stuff. Buy green bananas, aim to have things not all becoming ripe at once! Apparently if you cover the banana stem (where they all join together) with tin foil then they will last much longer – I haven’t tried this but it’s worth a shot! Try out the different tinned options before you go and buy a huge supply . You might not like the taste or prefer one brand over another. If there is a possibility that your tins might get wet, remove the labels and write on the tops in permanent marker what is inside. The labels can fall off if they get wet and block your bilge pump, and make dinner very interesting if you have no idea what is in each tin! Boxed long life milk takes up quite a bit of space and is heavy. Get used to mixing up powdered milk – it actually tastes quite good. Powdered eggs can be used as scrambled eggs and in other recipes that require eggs. They can last for up to 5 years and take up much less space than normal eggs. My new favorite breakfast: egg muffins! I found the recipe on Facebook, tried it, posted it to my page and have made it again. It’s so easy. I made a slight modification the second time. Whisk 8 eggs with 1/2 cup milk, set aside. Dice 1 c. onion, 1 c. green pepper and 1 c. ham and sauté in a small skillet. Really you can use any fillings you like. Spray the muffin tin cups with butter. Fill up 1/2 way with filling, top with shredded cheese of your choice, then fill cups with egg mixture. Bake at 375 degrees F. for 25 mins. I’m in the U.S. so I’m using measures I know. Sorry, Viki! You can also find the basic recipe on my page. These are good the next day too! While sailing with one foot on the wheel, laid back with not a care in the world and reading a Dan Brown novel with the other eye on the horizon from Nelson to Picton on an 8 hour journey my wife produced fresh bread and Chocolate cake from the on board gas oven!, this is in fact a very fond memory I have…and shows the importance of eating well at sea ! Don’t forget to keep Ethylene-sensitive fruits and vegetables away from ethylene-producing fruits and vegetables – like Bananas – there are others too! What a great guide for breakfast aboard! …. I’m hungry! Viki, another great post! I am also writing a post on provisioning, and how I am organizing it on my boat. Your breakfast options, with all the recipes, are most helpful! Have coffee press, yogurt maker, Bullet blender and bread maker on board. Well done! Can’t wait to read your post Carla. I love hearing how people provision. There are some great ideas out there! Can I eat on your boat?! All this sounds so yummy! 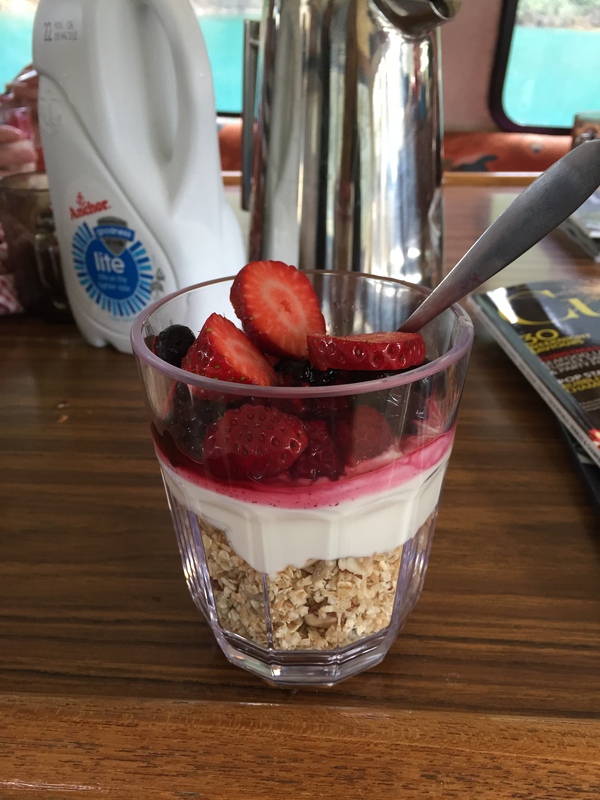 We eat pretty well at anchor, but I can’t say we do much more than oatmeal, muesli and milk and fruit, or eggs and toast and bacon on passage. Oatmeal’s always wonderful, though – something so soothing to the stomach in rough seas. And of course coffee, always coffee – love our stainless French press! I hear ya about supermarkets…not sure if you have Trader Joes or not but its huge here in the US. its not a standard commercial supermarket, but a more organic/trendy one. The place gives me anxiety…so disorganized, small, overcrowded and just a general cluster. I love the Mexican markets here in San Diego. Hey have you ever heard of the “WonderBag”? I just read about it, it’s designed for camping or other outdoors events which wouldn’t have power. You start your dish (like a soup or stew) on the stove, get it up to temp, put it in the WonderBag and it will continue to cook for 8 hours. Thought it might be good for a boat! *When you want to fry lots of eggs and have them ready together, crack them all into a single cup or mug. When ready, tip them all into the frying pan at the same time. Believe me, it does work although maybe not if the eggs are not fresh. *Cook Sausages and Bacon in a hot oven. Less smell and they will look after themselves and allow you to sail the boat or do whatever. It also frees up the hob for the kettle and eggs! Line the baking tray with tin foil to save washing up. Thick sausages take longer to cook than bacon so put them in 10 minutes earlier. To save space and get everything on one tray roll the bacon loosely end over end. *For breakfast on the go bread rolls are easier to handle than a sandwich.